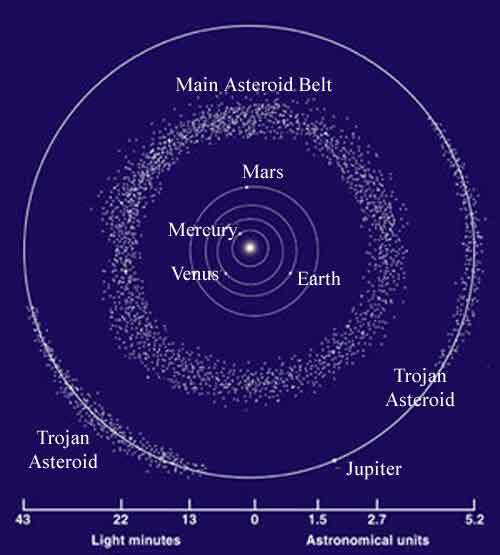 Image of the main asteroid belt between the orbits of Mars and Jupiter. The asteroid belt is a region of the solar system falling roughly between the planets Mars and Jupiter where the greatest concentration of asteroid orbits can be found. It is termed the main belt when contrasted with other concentrations of minor planets, since these may also be termed asteroid belts. A common theory agreed upon by many astronomers is that during the first million years of the solar system's history, planets formed by accretion of planetesimals. Repeated collisions led to the familiar rocky planets and to the gas giants' cores. However, in this course of the system the strong gravity of Jupiter inhibited the final stages, and the planetesimals could not form a single planet. The planetesimals instead continued to orbit the Sun as before. In this sense the asteroid belt can be considered a relic of the primitive Solar System, but many observations point to an active evolution of the physical conditions so the asteroids themselves are not particularly pristine. Instead, the objects in the outer Kuiper belt are believed to have had little change since the solar system's formation. Despite popular imagery, the asteroid belt is mostly empty. The asteroids are spread over such a large volume that it would be highly improbable to reach an asteroid without aiming carefully. Nonetheless, tens of thousands of asteroids are currently known, and estimates of the total number range in the millions. About 220 of them are larger than 100 km. The biggest asteroid belt member is Ceres, which is about 1000 km across. The total mass of the Asteroid belt is estimated to be 2.3×1021 kilograms, which is 1/35th that of the Earth's Moon. And of that total mass, one-third is accounted for by Ceres alone. The high population makes for a very active environment, where collisions between asteroids occur very often (in astronomical terms). A collision may fragment an asteroid in numerous small pieces (leading to the formation of a new asteroid family), or may glue two asteroids together if it occurs at low relative speeds. After five billion years, the current Asteroid belt population bears little resemblance to the original one. Asteroid belts are a staple of science fiction stories less concerned with realism than with drama, since they are always portrayed as being so dense that adventurous measures must be taken to avoid an impact. Proto-planets in the process of formation and planetary rings may look like that, but asteroid belts don't. In reality, the asteroids are spread over such a high volume that it would be highly improbable even to pass close to a random asteroid. For example, the numerous space probes sent to the outer solar system, just across the main asteroid belt, have never had any problems, and asteroid rendezvous missions have elaborate targeting procedures. The movie 2001: A Space Odyssey is unusual in that it does portray realistically the ship's "encounter" with a lone asteroid pair.